Watch & Win Cavs Jerseys Signed by Kevin Love, Collin Sexton, Larry Nance Jr. and Jordan Clarkson! 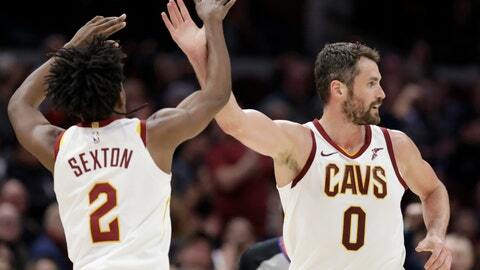 CLEVELAND, OHIO – FOX Sports Ohio and the Cleveland Cavaliers want to thank the viewers for their continued support all season with their annual Viewer Appreciation Night. Once every quarter, the FOX Sports Ohio Cavs broadcasters will present a hashtag keyword. Once the keyword is given, tweet it at @FOXSportsOH to enter. FOX Sports Ohio will select a random tweet of the hashtag as winner of the prize. Please note, the network will not be able to access tweets from private Twitter accounts. Must be 13 and older. Visit FOXSportsOhio.com for complete rules. FOX Sports Ohio is the television home of the Cincinnati Reds, Cleveland Cavaliers, Columbus Blue Jackets ,Columbus Crew, Cincinnati Bearcats, Dayton Flyers, and ACC and Big East basketball. FOX Sports Ohio and sister network SportsTime Ohio present more live, local sports programming than any other network or broadcast system in the market, producing over 750 live sporting events including 4,800 hours of live and original programming every year Together, the two networks reach over five million households in Ohio, Kentucky, Indiana, western Pennsylvania, western New York, and West Virginia. For complete regional sports news, telecast schedules and updated statistics, log-on to www.FOXSportsOhio.com.